We got back in the back seat and tested 4 new infant car seats, logging an additional 6 hours of hands-on product testing. We also got our hands on the refreshed 2015 lineup of our original crop of candidates. Even without the bells and whistles of newer seats, the Chicco Keyfit 30 remains the winner in this crowded field. When you’re getting ready to shop for baby gear, the car seat should be at the top of your list. If you plan on driving anywhere—you’re going to bring your baby home from the hospital, right?—it’s a necessity. A good one will allow for simple portability from car to stroller, and protect your baby in the event of a crash. In researching and testing fourteen different models, the Chicco Keyfit 30 was our top pick. Not only does it fit into a vast array of strollers, but it will provide a secure fit for babies as small as 4 lbs, growing with them up to 30-inches tall, making it one of the longest-lasting, most versatile seats on the market. For 2015 we added 4 new seats to our final list of candidates, for a total of 14. In total we spent 33 hours testing and researching to find the best one. In the end, the Chicco Keyfit 30 was our winner. Casual reading of user reviews implied that the best infant car seat had to be the newest one to hit the market, but we found that the ease of installation and seat weight were more valuable. Our candidates came from ten different manufacturers and ranged in price from as little as $80 up to $350. The testing included real world installation with LATCH (which stands for Lower Anchors and Tethers for Children, a system used for installations without the traditional seat belt, designed to make it easier for parents to install their seats correctly each time) or seat belts, in three different vehicles. We took notes from child safety experts, bloggers, and Consumer Reports, factoring all of that information into our decision. Infant car seats are for prospective parents who want a simple and portable way to drive around with their baby. Infant car seats can be fitted to stroller frames or full-featured strollers (usually with an adapter) for added mobility. You’ll want to think about your lifestyle when deciding between these two styles of seats. For most parents, you’ll have your baby during the day, running errands and going around town. What’s great about an infant seat is that when your baby falls asleep (which is going to happen a lot) you can take the infant seat from the car, and fit it to a stroller frame—hence the term “snap and go”—without disturbing your baby. With a convertible seat, you would need to unharness the baby, and put them into a stroller that either lays flat or has a bassinet; you’re likely to wake the baby. The infant car seat category is also strongly recommended by Consumer Reports, citing an infant car seat’s superior fit for tiny babies, and simple in-and-out portability. It’s important when shopping to know that not every car seat fits every stroller, so a bit of planning can be beneficial. For questions about compatibility, we’ve compiled a chart, with possible stroller and car seat combinations. An infant car seat has a base and a seat with a handle. They’ll fit most babies from birth, up to 12 months. If your baby is exceptionally tall or on the heavy side, they’ll outgrow the seat sooner than that. A good infant car seat should fit infants up to at least 28-inches tall and have a weight capacity of 25 lbs or more. Some seats have more limited maximum ranges, as low as 25 inches or 22 lbs. The lower sizes and capacity will limit the useful time of the infant car seat, prompting you to buy your next seat sooner. Our pick fits babies up to 30” tall with a weight capacity of 30 lbs. A lot of seats will say that they’ll hold infants up to 35 or even 40 lbs, which seemed awfully heavy to us—you’ll have to move up to a larger car seat eventually, and we’ve selected an option that gives you a good amount of use time without compromising of an infant-optimized fit. We interviewed car seat expert Cora Speck, a certified CPST and instructor, as well as the Trauma Injury Prevention and Research Coordinator at The Queen’s Medical Center in Hawaii: “The idea of keeping your 35-pound baby in this seat is preposterous, and a complete marketing gimmick. Carrying a 35-pound baby in a seat even a short distance could be a new part of CrossFit competitions.” With that in mind, look first at a prospective seats’ height capacity, and don’t worry so much about the weight capacity. The attributes that we found most important: low overall seat weight, a wide range of harness heights, flexible strolling options, and the aforementioned taller height limits. If you’re planning on strolling with your baby from day one, you’ll need a compatible stroller. The Chicco Keyfit 30 fits into a stroller frame made by the same company. If that’s not your style, the Chicco also fits into strollers made by: Baby Jogger, BOB, Britax, Bugaboo, Bumbleride, Mamas and Papas, Mountain Buggy, Phil and Ted’s, Quinny, UPPAbaby and Valco, just to name a few. Even though we tested seats that retail for as little as $80, we felt that many of them weren’t all that great. The bases of these seats felt flimsy. They also had plasticy seat covers that retained heat, and felt rough. The $150-$200 range gets you a seat that’s easier to install, with nicer fabrics, and a more diverse range of compatible strollers. The premium tier of seats goes up to as much as $440. These have improved soft goods, additional safety features, and typically fit similarly premium strollers. We followed a similar procedure in testing our infant seats as we did in our convertible car seat guide. This involved taking our top four candidates into the real world for a series of tests. We thumbed through the manuals, noting the clarity (or lack thereof) of each set of instructions, installed the seats into our test vehicles, and measured how much room they took up in the back seat. We used three cars, a large SUV (Lexus RX350), a hatchback (Honda Fit) and a family sedan (Toyota Camry). Each car seat was installed with the seat belt, and followed up by a separate LATCH installation. After extensive test fitting and measuring, our choice was the Chicco Keyfit 30. The seat fits children starting at 4 lbs, up to 30 lbs or 30-inches tall with a 7-inch bottom harness height, making it an excellent choice for preemies or low birth weight infants.The included infant cushions fit children from 4 to 11 lbs, and can be removed after that to make more room. It was the easiest to install, and fit into both center and outboard positions in each car. It was the narrowest seat we tested, at only 16.5 inches wide, and it took up the least amount of room lengthwise in both back seats. Since this guide was first published, our pick has gotten a mild refresh. A new, larger 3-panel canopy and new colors are now available and the MSRP has risen to $200 (from $190), although you can find it for less. Some of the other models couldn’t accommodate a center installation, while others had us moving our front seats up to the dashboard. When choosing where to install your seat, keep in mind that the safest position is the one where you can get the best install. This means that once the seat has been installed, it shouldn’t move more than one inch side to side or front to back at the belt path. It should also be at a 45-degree angle. With the Chicco Keyfit 30, an adjustable foot can be deployed into different positions to achieve the proper angle. We liked that the Chicco Keyfit 30 had easy to identify features and buttons, all in the same orange hue. These brought attention to the base height adjustment, handle, LATCH, lock-offs and the release mechanism. Instructions were also stickered onto the base for quick reference during installation. What impressed us the most was how easily the seat could be installed with a seat belt in the center of the backseat. Many cars don’t have a center set of LATCH anchors, forcing you to use the seat belt for the installation. We had no trouble with our center install, due to the side-mounted belt lock-offs that secured the seat belt. If your baby is going to travel in more than one car on a weekly basis, we’d suggest investing in an additional car seat base. When you buy your infant seat, it will come with the bucket seat, and one base. The base gets installed into the vehicle, and stays in the car when you take your baby out for a stroll. If another person is going to pick up the baby, you can install an extra base in their car. This way, they don’t have to worry about securing the baby’s seat without the base, or having to figure out how to uninstall and reinstall the base. Both of those take time to do, and in the early stages of infancy, you’ll take all the extra time that you can get. The baby will travel with the car seat, so there’s no need to have an additional car seat, just extra bases. They’re not cheap—at around $90, they’re nearly half the cost of the car seat itself—but they are very convenient. Even though the Chicco Keyfit 30 was our winner, there are a few things about it that we’d like to see changed. The fabric on the Chicco is nice, but it isn’t nearly as breathable as the fabric on the Nuna or Cybex seats that we tested. In addition, the installation without the base took much longer than it did on the other seats that we tested. This is done using both lap and shoulder portions of your seat belt, and affixing them across the base. This is fine for occasional trips, or taxi rides, but shouldn’t be your everyday method for securing your child. Wrapping the seat belt around the car seat takes a lot of time, and involves a good amount of force to secure the seat. It can also be harder to achieve the proper 45-degree angle that’s required for rear-facing newborns without your car seat base. On Amazon, the Chicco Keyfit 30 has a score of 4.6 of 5, with 331 reviews. Positive feelings center on the easy installation, and how much space it saved in small back seats. For those who are into the newest technology, we like the Cybex Aton Q. The Q runs $349, a significant jump in price from our pick, but offers additional features. You’ll get a load leg, linear side impact protection, a no-rethread harness with an adjustable seat floor and similar stroller compatibility. Keep in mind that this seat will not work in many center seating positions, due to the load leg, and will instead have to be placed in an outboard position. Many cars have raised humps in the center of the floor that prevent the deployment of the load leg. Since this seat is new, it’s not yet available on Amazon, but can be found in many brick and mortar stores. The Graco Snugride Classic Connect 30 is a great choice for those who want a budget-friendly seat (it’s less than $100), without compromising on stroller compatibility, and capacity. This seat fits infants from 4 to 30 lbs or 30 inches. The Classic Connect range of seats fit onto most premium strollers, and are available with different features and capacities. This model is right in the middle, and includes an improved base as compared to the standard Snugride, making it much easier to install. Baby Trend Flex-Loc — Very few compatible strollers, and a poorly designed base. LATCH belts were at a strange angle, limiting the amount of force that could be used to tighten the base. 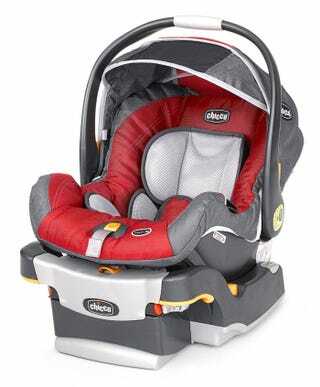 Britax B-Safe Elite 35—While new and improved, the seat’s new features add weight to the carrier. Installation was difficult, as the adjustable foot wasn’t always tall enough to provide the right angle for newborns. Evenflo Embrace LX — Cheap fabrics got hot quickly. The seat is bulky and has limited compatible stroller options. A new design should be arriving come the end of 2015. Graco Click Connect 35—Bulky and heavy. The fabrics are plasticky and the base recline foot is temperamental at best. 2015 Maxi Cosi Mico AP — Lower seat capacity (22 lbs or 29” max). The base does not have a lock-off for seatbelt installations. Nuna Pipa—Rigid Latch installation, and a load leg. Even though these are great features, they can complicate installations and the seat takes up more room lengthwise because of it. 2015 UPPAbaby Mesa—The New 2015 Model makes improvements, but the seat still has limited strolling options, and weighs over 9 pounds. Maxi Cosi Mico Max 30—The Anti-Rebound bar makes this seat about an inch and a half longer lengthwise than the original Mico AP, making installation in smaller cars challenging. The new shoulder pads are very large and can interfere with the placement of the chest clip on smaller babies. Phil and Ted’s Alpha—Very basic design that lacks the level of padding on other seats. The base was difficult to install, and there are better options for the price ($200). Peg Perego Primo Viaggio 4/35—Anti-rebound plate takes up space and can complicate the installation in some cars. In addition, consumers complain that the seat doesn’t make any noise once the seat is clicked into the base, a potential safety hazard. Doona—After almost a year of waiting, this finally made its way to store shelves. While an impressive concept, the base was difficult to install. The base’s level adjustment is a small dial that is very difficult to adjust if you need a deeper recline, especially if you try to use it after tightening your seatbelt or LATCH. Hopefully this will be addressed in the 2nd-generation version of the seat. Your infant car seat will get dirty, or soiled, or spilled on—this is inevitable. For starters, keep in mind that your infant seat will last for about 12 months. It’s a year, so don’t spend forever trying to keep it spotless. If you plan on using it for the next child, wait until the first one has grown out of it before taking it apart. For seat fabric, manufacturers universally recommend spot-treatment as the first course of action, followed by gentle machine washing. The seat’s harness straps cannot be machine washed, as the detergent and agitation can actually break down the fibers, and reduce their effectiveness. According to The Car Seat Site, a damp cloth or a toothbrush are your best tools for combating these stuck-on messes. The plastics on the seats can be cleaned with warm water and soap. These details can be found in your seat’s product manual. Nothing tricky here—just don’t machine wash those straps. It’s important to read your instruction manual, and to practice using your seat before the baby arrives. Misuse can lead to injury, but is easily preventable by being informed. Car seat expert Cora Speck emphasized the harness clip position as a common error, which could lead to a blocked airway or even internal organ damage in the event of a crash. Each company has created online tutorials, and some have gone the extra step and made Youtube videos, in order to help parents install their seats. These are quite helpful at giving you an overview of what your seat does. If you feel at all unsure about how well you installed your seat, take it to a car seat check event, or find a local Child Passenger Safety Technician to get it checked. Jane Usa will be bringing their Koos infant car seat to the market come Fall of this year, boasting a 6-pound seat and load-leg equipped base. 6 pounds! It will be the lightest infant car seat on the market when released. Another seat that we had previously mentioned, the Cybex Aton Cloud Q, will be arriving in May of this year (2016). It will carry over all of the features we love about the original Aton Q, but will add an adjustable lay-flat design for use on a stroller. Even with new seats hitting the market, the mainstay Chicco Keyfit 30 was our choice as the best infant car seat. Installation was simple in each seating position, and the seat took up less space in our back seats. The best part about the installation was how easily we were able to achieve a tight fit in the center of the back seat with a seat belt, something that other bases made very difficult. On top of that, it will fit onto most premium strollers, and a variety of snap and go frames, including their own.